As we age the natural whiteness of the teeth can begin to fade, which can be a result of alterations in the mineral composition of the tooth enamel. If you are partial to a glass of red wine, cup of coffee or you smoke, you may notice that the discolouration process is accelerated. Whitening has been in existence for centuries. Lightening the teeth for aesthetic reasons dates back to the Ancient Egyptian civilisation, when wine vinegar and pumice were used to remove surface stains. Tooth whitening involves using oxidising agents, including hydrogen peroxide and carbamide peroxide, to brighten the teeth. The oxidising agents penetrate the enamel to reach the internal stains, and over the course of time, the dentin layer beneath the enamel also becomes bleached. The results of tooth whitening usually last for a number of months, but this is dependent on the individual; smoking and drinking strongly-coloured liquids can cause premature discolouration. At-home whitening is when patients wear specially designed trays that contain a bleaching agent. The trays contain a low intensity oxidising agent, which is placed in close contact with the teeth for approximately 6 hours per day during a period of between 5 and 15 days. The results of at-home whitening vary depending on the system used. Some people experience a dramatic difference in just a few days, while others notice little change. In most cases, tooth whitening is very effective and can brighten the shade of teeth significantly. However, there are certain stains that do not react to bleaching. Tetracycline staining takes longer to bleach because the agent must reach the dentin layer of the tooth. If staining affects part of the tooth the results may not be as impressive, as the difference between the unstained and stained parts of teeth will remain visible, despite the tooth looking whiter overall. If a tooth has white spots this may become more noticeable after whitening. Generally speaking, whitening treatments are less effective when the teeth are decayed or the natural colour of the teeth has a grey tinge. Possible side-effects of bleaching include chemical burns (may occur if a high concentration of oxidising agent comes into contact with unprotected tissue), increased tooth sensitivity, and over-bleaching (can make the smile look unnatural). The most common side-effect is temporary sensitivity. This usually occurs during the early stage of the bleaching process, but it commonly subsides within 3 days. Irritation is usually caused by ill-fitting trays, rather than the bleaching agent. 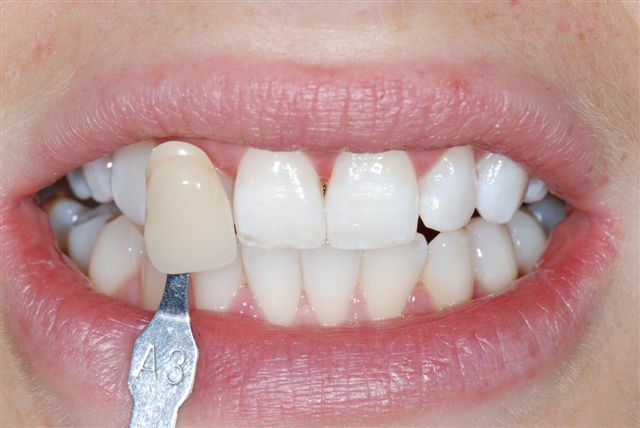 Tooth whitening has no effect on the colour of restorations made from ceramic material, porcelain or metal, but it may alter the shade of composite restorations slightly. In line with the new EU regulations 01/11/12 all our whitening products contain no more than 6% hydrogen peroxide or equivalent.